Monday, June 20th, 8:20 p.m.
“SABLE SPIRIT” entered by Aleshia Kiedaisch. Congratulations Aleshia! MONDAY, JUNE 20th, 1:15 p.m. Thank you to everyone that has taken the time to send in your entry. I am overwhelmed and humbled by your responses. There have been 257 names entered . . . but I can only pick one. However if you would like to suggest titles for any of the other paintings, please feel welcome to do so. I may not be able to email each of you personally to thank you, but please know that I appreciate each and every suggestion. I’m stumped. 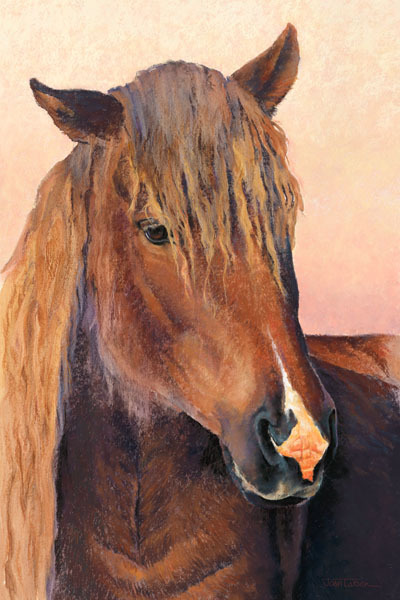 I have not been able to come up with a title for this artwork that accurately reflects the quirky expression on this horse’s face. So I thought that I would like some help with the naming. The winning name will be announced on Monday, June 20th and the winner will receive a limited edition print of the artwork.